The age old Turkish Bath or Hamam, as it is often referred, is a traditional part of Turkish culture that is a treat to experience when on a crewed yacht charter along the coast of Turkey. Believed to actually be related to the ancient Greek and Roman baths, the Hamam has now evolved into a specific cultural tradition that is all Turkish. And in response to modern times the Haman has also developed into a spa treatment available at many Turkish hotels and spas. Whether you choose to experience the original true Turkish Hamam or enjoy a Hamam type experience in a Turkish spa, either way, having a Turkish Bath while in Turkey is a true part of Turkish life and culture and easy to enjoy while on a yacht charter in Turkey. 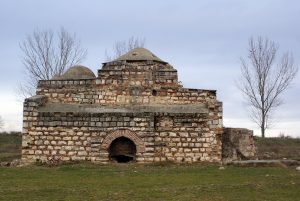 The Turkish Bath was perfected by the Selcuk Turks who developed this traditional Hamam bathing in answer to Islamic religious views on the importance of cleanliness. In the 16th century there were reportedly over 4500 private baths and over 300 public baths just in Istanbul alone. 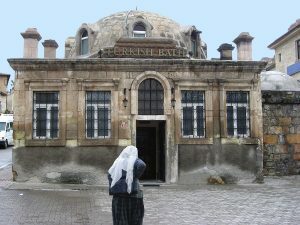 The Hamam soon developed into far more than a bathing location, and quickly became the social and political center of daily life, or the golf course or men’s club of yesteryear. And women were not excluded from the bathing or social aspect of the Haman experience, as the Hamam developed into one of the only avenues for women to socialize outside of the home. Anecdotal history reports that the Hamam was so important to women in that time period, that a woman not allowed an allowance for Hamam visits was entitled to a divorce. In a Turkish Bath today, still in use are the traditional checked cloths or Pestamal, used to wrap around the body in preparation. However in most locations, flat plastic sandals have replaced the wooden clogs, or Takunyalars, some of which were once highly decorated with inlaid mother of pearl. The traditional Turkish Bath begins by changing into a Pestamal and donning a pair of Takunyalars in a changing room and after passing through a cooling room, entering into a usually domed room filled with heated steam. 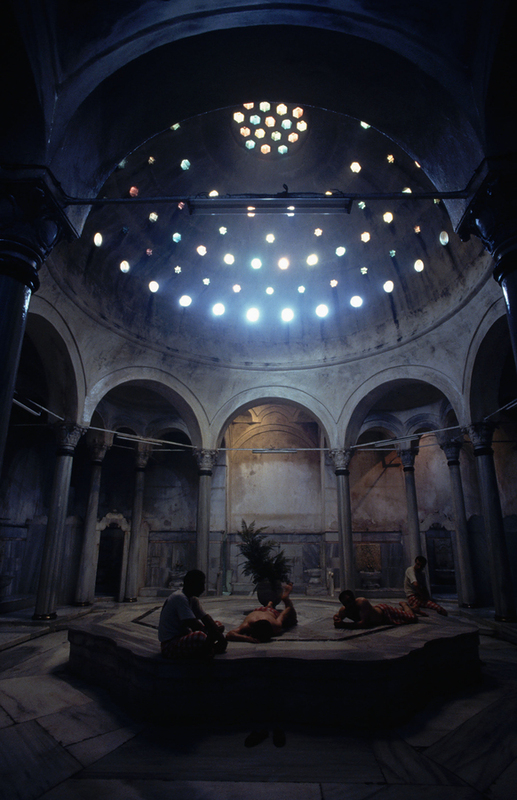 Many of the traditional Hamams were built during the Ottoman Empire, and those still in existence today are identifiable by the domed roofs pierced with bits of colored bottle glass that provide a misty light in the interior of the main bath room. 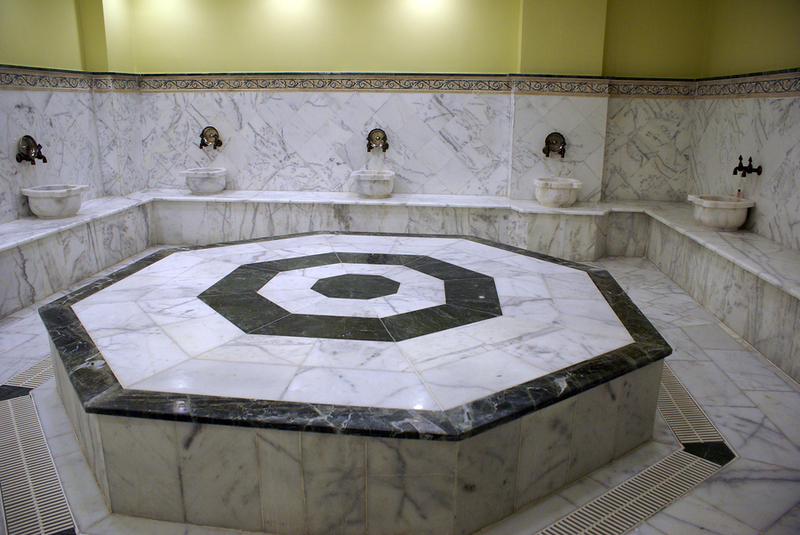 In a traditional Haman, in the center of the domed room is a large marble slab and around the edges of the room are cubicles or benches around water taps. 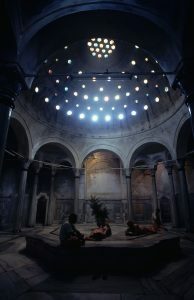 The ritual starts by relaxing in low seats along the edge of the domed room and pouring warm water over oneself with a Tas or special Hamam bowl. (Antique Hamam bowls can still be found throughout much of Turkey and are a great souvenir of this unique tradition). Once suitably warmed, with skin softened by the repetitive dousing with warm water, it is time to recline on the marble slab in the center. There a washer person, once a non-Islamic slave, provides a soapy bath, with suds created by blowing into a large muslin bag drenched in soapy water, and a massage, scrubbing the body all over with a loofah or loofah mitt also known as a kese. For those not in the know, a natural loofah is a plant seed pod in the cucumber or gourd family that grows on a vine all over Turkey. Being fully scrubbed with a loofah exposes a new clean layer of skin. After washing, then step under running cool water and out into the relaxing room for another massage with oils or just a drink of apple tea or chai. You should emerge much cleaner than when you arrived with baby fresh skin having experienced full exfoliation by natural loofah or kese. And if a more pampering spa type treatment is of interest, try a Hamam type treatment at a Turkish Spa. Other than hiking back into the countryside, finding a truly traditional Turkish Hamam is hard outside of Istanbul. In Istanbul, for a traditional Turkish Bath, we like the Ayasofya Hürrem Sultan Hamamı, also known as the Haseki Hürrem Sultan Hamamı. 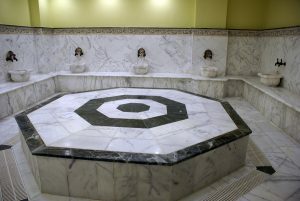 This traditional Hamam is located in a building designed by the legendary architect Sinan in 1556 for the once concubine, Hürrem Sultan (Roxelana), who later became the wife of Sultan Süleyman the Magnificent: http://www.ayasofyahamami.com/en/index1.html. Trying a Turkish Bath or Hamam is part of enjoying the full Turkish Experience on a crewed yacht charter along the southern coast of Turkey, and whether you try a traditional Hamam or a spa Haman treatment, this is a Turkish experience not to be missed.